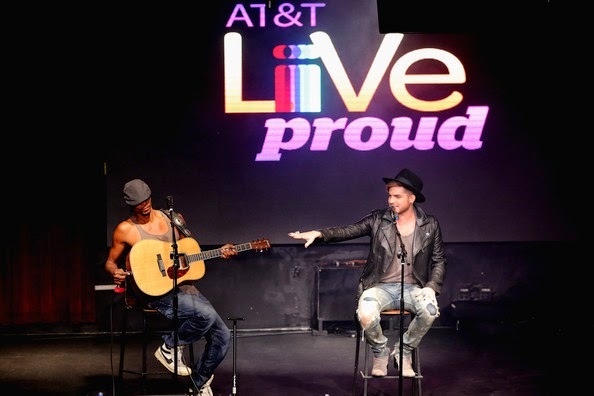 Adam Lambert partnered with AT&T for the second year on the Live Proud movement and rewarded fans, this time on the east coast, for a seated acoustic performance. Adam speaks highly to his Glamberts ’cause they accessorize! Thank you to TALC for the following full-length performance video. For more about AT&T’s event, read here. joined you on your wondrous journey. Thanks Carol for sharing this with us. He brings tears to my eyes when he sings. I am so happy for his success. I can only imagine how he must feel being the front man for QUEEN after them being his IDOLS for so many years. I hope all his dreams come true because he is a down to earth and wonderful person. LOVE LOVE LOVE him and always will. Just wish I could see him again. I saw him at Hard Rock in Hollywood Fl. I love his look much better now. But no matter what he is wearing he looks beautiful. Thanks again Carol for sharing this very personal video with us. You’re welcome Mandytwo! I’m glad I found this so soon! It’s great seeing/hearing him in a different setting! The AMA’s were rated TV14L for strong laagunge. That means a parent could let their 14, 15, 16, 17yr-olds watch with nothing to worry about but occasional cursing. Now let me ask you, what do you think would happen to middle or high school student if they gave the same performance at the school talent show? Lambert stuck his crotch in the faces of two dancers, had one dancer fondle his privates while he fondle yet another dancer. Janet Jackson also fondle a dancer inappropriately for a program rated TV14L. As parent and a youth advocate, this issue isn’t about what adults can handle or want to see, it is about media that is specifically targeting our youth on the public airwaves. Adam is such an amazing role model, I could not be any prouder of him & being a Glambert!!!! !